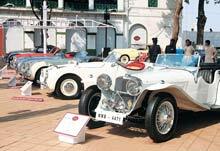 When Cartier organised a display of 60 vintage cars in Mumbai recently, it drew a ritzy crowd, including Shah Rukh Khan, Prince Michael of Kent, no end of Maharajahs and the drummer for Pink Floyd. Anamika Butalia joined the party. There’s quite a crowd gathered at the Mumbai Turf Club, next to the Mahalaxmi Race Course. Jackie Shroff is here having a drink with Yuvraj Singh and Shobhaa De. Behind them are Minisha Lamba and Koel Purie, a former Miss Afghanistan and Maureen Wadia. Later they will be joined by Shah Rukh Khan whom everyone will wish happy birthday—he turns 43 (November 2). But this event isn’t about Shah Rukh Khan. It’s about cars, many of them much older than him. 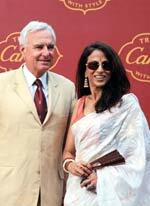 It’s the Cartier ‘Travel with Style’ vintage car event. It took 17 months to pull it together—from hand-picking the 60 vintage classics and bringing them together from all over the country, to arranging them over two acres and inviting an illustrious list of car enthusiasts. The likes of Prince Michael of Kent, for example, and Professor Gordon Murray, who designed the F1 McLaren. Not to mention cricketer Imran Khan and supermodel Yasmin Le Bon. We’ve all heard of someone owning one or two vintage cars. He’s not alone—Dharamaditya Patnaik (44) of Bhubaneshwar owns 35 vintage cars. He talks of his “exotic” Rolls-Royce 20hp, which was especially built in 1923 with a special “dual mechanism” with hand controls for the Maharana of Udaipur, who was paralysed from the waist down. Then, he points to a Mercedes Benz 630 which was previously owned by Alexandrajeet Singh of Bhinga, UP, who was shot dead in this car while on a shikaar, and the damaged car had been grounded in memory of its owner. Although owners are cagey, they reveal that the amount they’ve spent on buying and maintaining these cars could have bought them between two to eight of the latest models of Mercedes Benz. “Honestly, despite the expenditure, I’d rather own a single 1940s model of the Benz than the latest ‘high tech’ ones,” says one 1920s Bentley owner, who didn’t want to be named. There’s a whole lifestyle around the vintage car world. Almost 60 per cent of participant/owners are members of car clubs. There are clubs in Mumbai, Delhi and Kolkata, each 30 to 50 members strong. The members are a mix of corporate honchos, royalty and others described as (I am told) “those who love their cars more than their own spouse”. Ask Vikram Singh, the President of the Jodhpur Heritage Car Club (JHCC), about the activities of the club, and he speaks passionately of winter rallies and races he has arranged. “Clubs can be easily termed ‘a guy’s gang’, where we attend meetings to discuss car restoration processes, where to find the smallest nuts and bolts to fix its mechanism, often over some beers,” says Singh.